Kudos to kababayan Accordion Guy on his commitment to the barong for his much anticipated hitch-up. The barong is also my outfit of choice for classy coat-and-tie events; there’s no formalwear quite like it: cool, breathable, easy to wear, without any complicated knots or color schemes to worry about. As an added bonus, the people around you can rest assured that you carry no concealed weapons on your person. Oh yes, Barongs are so nice. 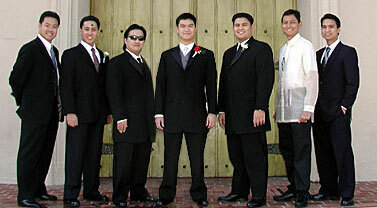 I wore one for my wedding many years ago as did all of my groomsmen. It was a strange site here in the Lou. Yeah, I got married in a barong. Much better than a suit and tie.